Written by Janet Choi on February 17, 2016 . One of the top email marketing mistakes is trying to squeeze everything into one message, and welcome emails are no exception. In that pivotal moment of first impression, the temptation is high to get the reader to do it all: here’s everything you need to know to get started, upgrade here, follow us on Facebook, check out these cool features, oh and welcome! 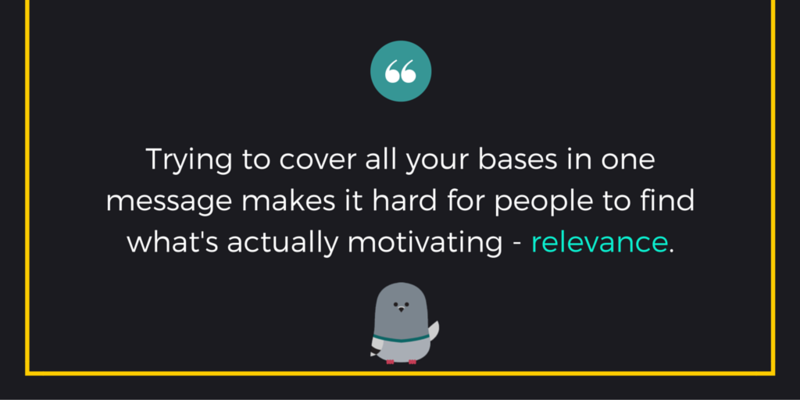 That jumbling makes it hard for people to connect and find what’s actually motivating — relevance. 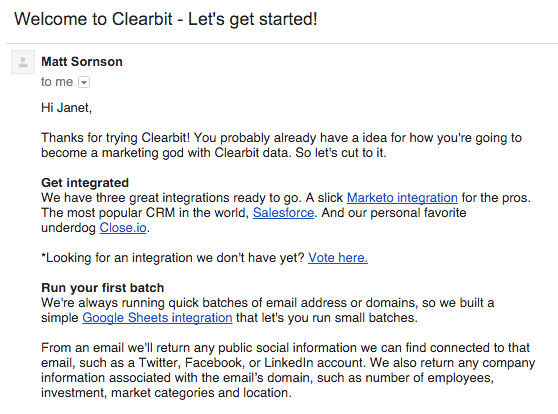 So when we saw how Clearbit was personalizing their welcome emails through Customer.io, we were thrilled and inspired. Clearbit started out sending a general welcome to everyone who signed up, but the team realized that they weren’t dealing with a mass of generic John Does who all wanted the same thing. Instead, their customers had three distinct roles — engineering, marketing, and sales — with distinct needs. What if they could trigger a welcome email with a message that was personalized based on the role? Fortunately, Clearbit is a business intelligence tool that enables you to look up and automatically pull in data about companies and people. The fact that they were already piping in their own Clearbit-enriched data into Customer.io made that personalized automation possible. Here’s how they did it! 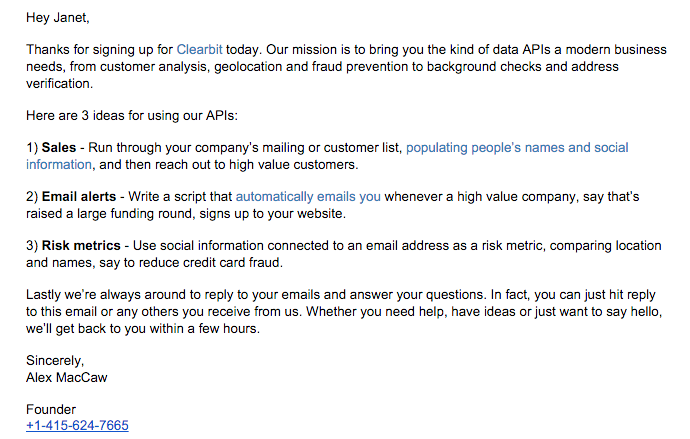 The early versions of Clearbit’s general welcome message that got sent to everyone are brief but not very specific. Here’s the first iteration of this general welcome: While the email gets many welcoming elements right, the message provides an array of use cases and suggestions that don’t quite come together. This information mash-up makes it more difficult for an individual to figure out what Clearbit is and how it will help them do their job better. A marketer might not be capable of writing scripts while a developer probably has absolutely no interest in sales activities. “We were trying to cover all the bases with one email,” as Clearbit’s Matt Sornson told us. In contrast, here’s the newer marketer-focused welcome, and you can tell from the first few lines who this message is for. This reader is going to become a “marketing god with Clearbit data”! As a developer, getting an email that gave me links to the docs and the encouragement to build something cool was immediately useful and a breath of fresh air compared to other emails I’ve received. It was motivating to not have to dig through things to get what I needed. Clearbit is seeing the positive impact as well. With most users coming in the door identified as developers, the emails are seeing these paid conversion rates: the marketing welcome converts at 7.3%; developer at 3.6%; and sales at 1.8%. 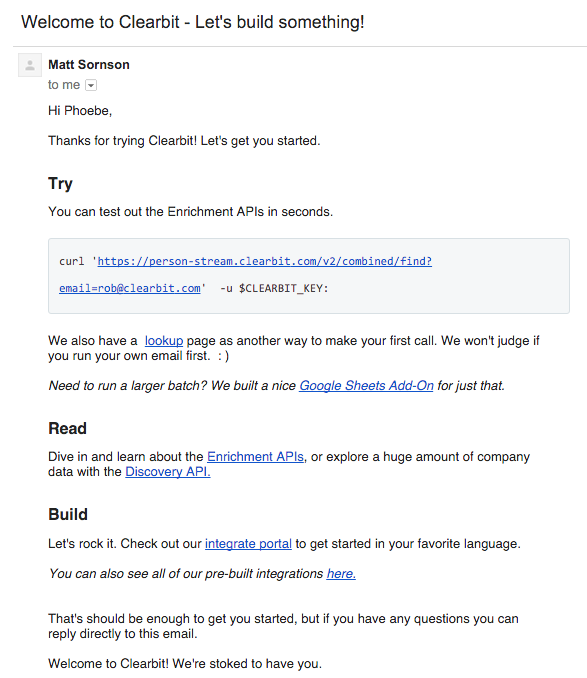 Compared to those early, non-specific emails, Matt Sornson observes, “It’s clear that it makes a pretty big difference to be able to send those different emails.” Now, you don’t need a Clearbit integration to start tailoring your own welcome messages. Maybe you’re receiving job role information as part of your sign-up flow, or you have data identifying which landing page or marketing campaign new users came in from, or you know what level plan people sign up for. The data you collect and insights you learn about your customers serve as valuable information for you to deliver better experiences and more effective messages to your users. Gone are the days of grasping at straws in front of your audience. Instead of making tentative guesses like “if you’re a developer” or “if you’re on the Gold plan” and trying to cover all your bases with a well-meaning (but crazily optimistic) kitchen-sink approach — you can come up with a sharp, effective, and helpful welcome that sticks. Do your customers fit into different personas? How do you personalize your approach! Our ears (well, eyes) are wide open in the comments.